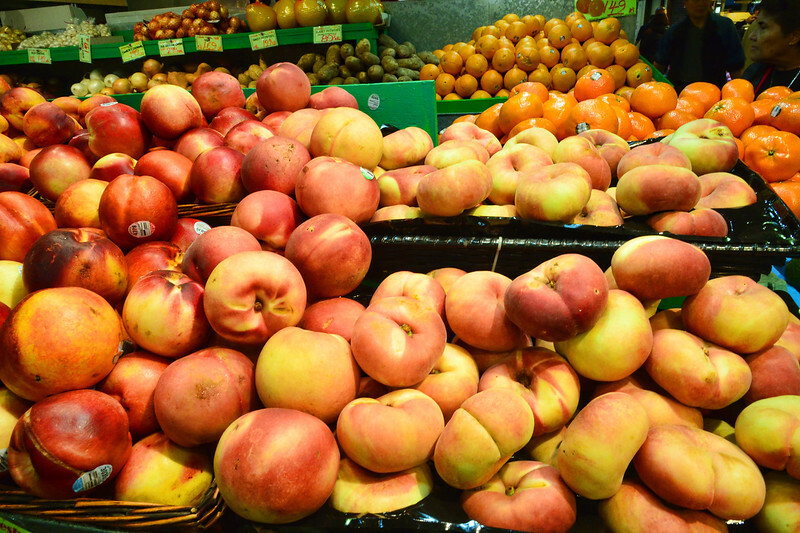 Abundant and Delicious Peaches - CHANGE: Nectarines & Donut Peaches! I believe the fruit to the left side of this shot to be Peaches, but the ones in the foreground and to the right (that have a squatter body) I'm not sure what those are. I'd really love your input if you know. This is another of the delicious displays in the Granville Island Market in Vancouver. I could spend hours in that wonderful place. Have a "peaches and cream" day. LATE ENTRY: Thanks to Arctangent, Terry and Elizabeth for identifying the fruit in the photo. On the left are nectarines and the right are Donut Peaches. I truly appreciate the information Ladies!!! Have a fantastic day! A salivating image !! I can nearly taste them ! Nice shot from Granville Island. The ones on the left are nectarines and on the right are a flattened peach cultivar such as 'Donut' peach, said to be very sweet and tasty. They came original from China, and the name comes from the shape you get when you push the freestone stone from the peach.